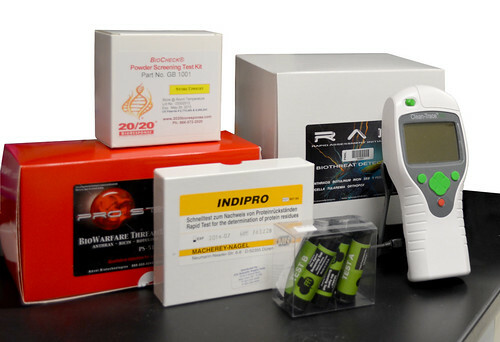 Pictured, are just a few biodetection instruments and sampling products of several dozen among the comprehensive listing in the updated 2014 product guide now available from DHS S&T and PNNL. RICHLAND, Wash. — A 2014 update to a detailed product guide listing biodetection technologies and sampling products is now available. The updated digest provides a comprehensive compilation of commercially available detection devices and products published to help first responders when purchasing equipment and supplies needed to rapidly assess biological threats. The Department of Homeland Security's Science and Technology Directorate and the Department of Energy's Pacific Northwest National Laboratory just made the revised report - Biodetection Technologies for First Responders: 2014 - available free of charge. The technology summaries in the new version of the report provide web links, equipment specifications, pricing, and annotated references from peer-reviewed publications for about 30 detection technologies and 25 sampling products from nearly two dozen companies (note that PNNL does not sell or endorse any of these products). The revised 2014 report can be found here. This report updates the previous edition, which was downloaded more than 5,500 times. "We believe first responders and purchasing specialists will find the updated report a valuable product-buying guide," said Cindy Bruckner-Lea, PNNL principal investigator. "With dozens of companies, technologies and sampling products listed, the report provides a convenient and useful resource to fire fighters, law enforcement and hazardous materials response teams." More than 69,000 publicly reported suspicious powder incidents have occurred in the U.S. since the 2001 anthrax attacks. The events continue across the nation at a rate of about five per day, including several incidents involving ricin in 2013. "Rapid biodetection is essential to the first responder community," said Seattle Fire Department Assistant Chief, A.D. Vickery. "These professionals are on the front lines everyday ensuring public health and safety is protected and preserved." In addition to the report, PNNL is nearing completion of its first round of independent biodetection technology performance evaluations. The initial focus of the product appraisals will be on the ability of the products to detect anthrax and various forms of ricin, as well as the impact of a wide range of commonly encountered hoax powder materials. PNNL intends to provide its initial results of this independent analysis at the International Association of Fire Chiefs conference later this year. PNNL team members and other first responder hosts will be sponsoring a 90-minute session at the IAFC International Hazardous Materials Response Teams Conference May 29 to June 1, in Baltimore, Md. The May 30 session will include brief presentations on technology testing results as well as use and instrument limitations. However, the session's primary focus will involve interactive discussions on the needs, gaps, priorities and useful tools that can assist first responders in making informed choices when facing a potential bioevent.